Notes: In 1928 the Southern Railway opened a concrete 5-road shed, with an eastlight roof and one through road, as well as a large marshalling yard to the west of the Town station. 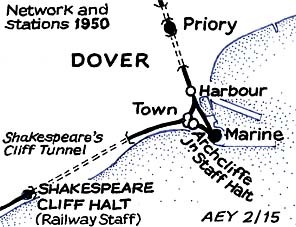 The yard covered much of the station site and included access from the Folkestone line to Dover Western Docks. The platform was partially rebuilt with a curve towards Dover Marine, and Archcliffe Junction signal box was resited to the west end of the platform; this opened in June 1928. A record in the National Archives (AN 157/469) describes a staff halt at Archcliffe Junction signal box in January 1948. This was presumably the old Town platform. 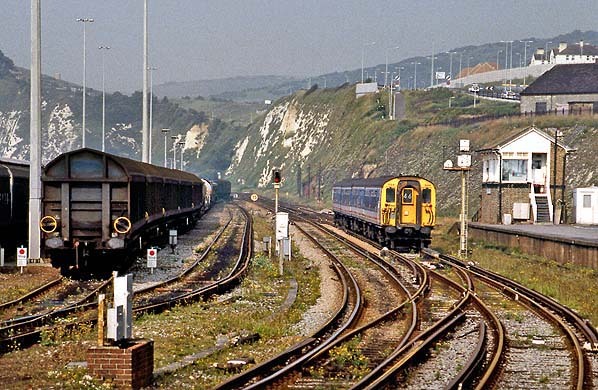 The last train ferry sailing from Dover Western Docks was the 13.30 from Dover on 22 December 1995 by which time all general mixed freight was going through the Channel Tunnel. No further traffic was handled by the Dover Town yard although it was used for the storage of condemned wagons for a few months. The track was lifted in 1997 although Archcliffe Junction signal box did not close until 12 April 1998. It is not known how long the platform was used by signal box staff. 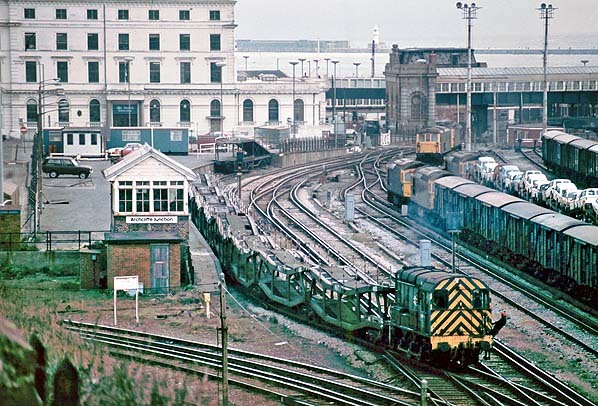 09019 shunts cartics from the old 'Military Platform' at Archcliffe Junction into Dover Town Yard in February 1981. The old Dover Town platform was rebuilt with a curve in 1928; the bay allows vehicles to be loaded onto the cartics. Archcliffe Junction signal box was opened at this location in June 1928. In the 1940s the platform was also the Archcliffe Junction Staff Halt. 1957 1:2,500 OS map shows Archcliffe Junction signal box at the west end of the old Dover Town station platform. This was the site of the staff halt. In July 1994 the 07:25 boat train from Victoria is seen passing Archcliffe Junction signal box, on the final approach to Western Docks. The train has just passed through the site of Archcliffe Tunnel which was opened out in 1928. The platform has been rebuilt from the original Dover Town platform. In the 1940s it acted as Archcliffe Junction Staff Platform. 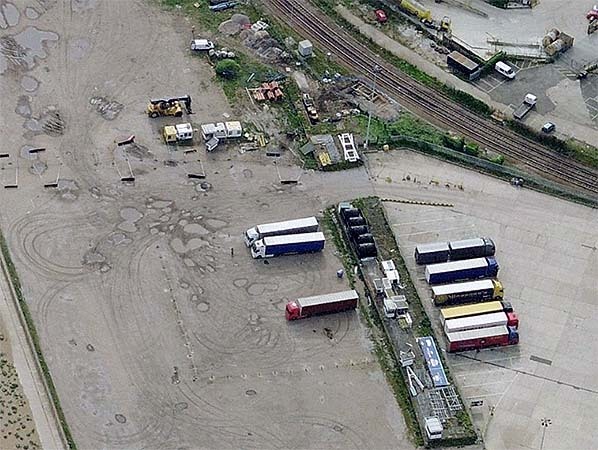 The Dover Town Freight Yard is seen on the left. 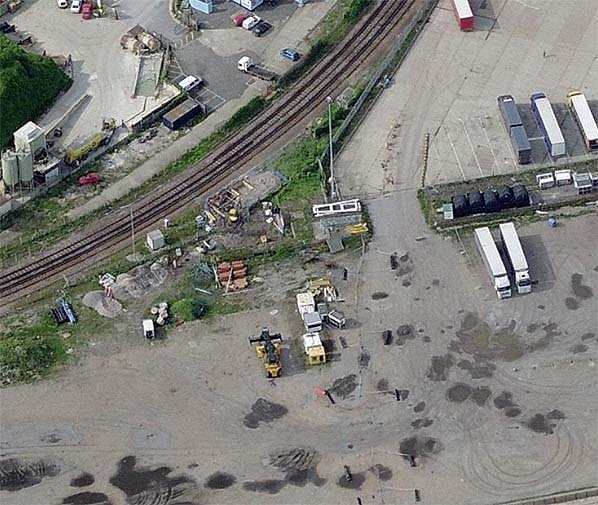 A recent aerial view showing the site of Archcliffe Junction, part of the old Dover Town platform which also acted as the later staff halt is still there.